A new shop for MOLINARO VISION and new glasses added to the collection! The glasses, Doc’s Spectacles, are designed by Doc Wrangler from Doc’s Men’s Wear. A thank you to him, because he made this vendor especially for me, really appreciate that! 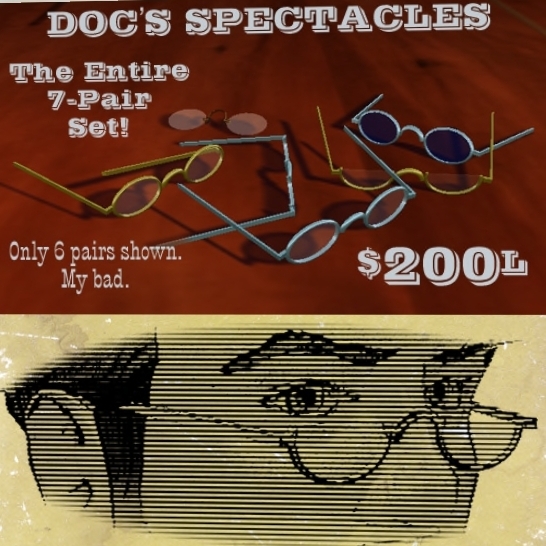 It is a package of 7 male-glasses inspired on the wild west theme. For only 200 LD these are yours! The new shop is a little shop at the Diamonds sim, next to the Aurora main-shop. Aurora offers you fashion for a reasonable price, and right now, they are giving away cute little shorts, fitting perfect with the atmosphere of the shopping area, a beach feeling with boardwalk boutiques. Also you can try your luck at the lucky chairs, I am really addicted to them and owner now of a new lingerie set, skinny jeans and snow-boots all designs from HarmonyJade Yifu of Aurora. Hope to see you at MOLINARO VISION – Eyewear in SL @ Aurora soon! UPDATE 23-05-2009: MOLINARO VISION can not be found at Aurora anymore. [1:58] Rickybobby Yifu: i had to return your stuff cause im closing the mall down.